GAZA CITY, Gaza Strip (AP) — A prominent Islamic scholar making a landmark visit to the Gaza Strip declared Thursday that Israel has no right to exist and voiced his support for rocket fire on Israel, giving a boost of legitimacy to the militant Islamist Hamas rulers of the Palestinian territory. Yusuf al-Qaradawi is the latest of a few high profile figures visit Gaza, boosting the Hamas effort to break its international isolation. The U.S., EU and Israel brand Hamas a terror group, while the rival Fatah, which rules in the West Bank, enjoys Western backing. 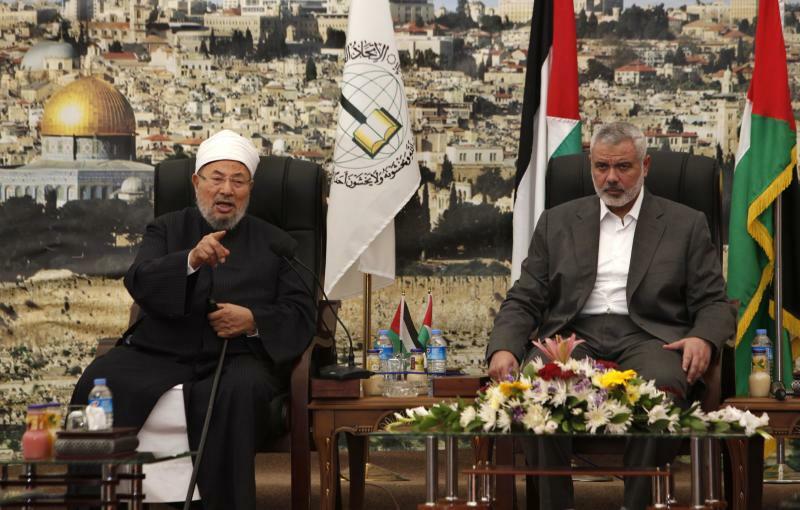 Al-Qaradawi issued the strongest anti-Israel declarations of any of the visitors to date. "This land has never once been a Jewish land. Palestine is for the Arab Islamic nation," said al-Qaradawi, a Qatar-based cleric made famous by his popular TV show and widely respected in the Muslim world. "The rockets made in Gaza are more powerful than the (Israeli) occupation's rockets," he added. Hamas seized control of Gaza in 2007 following several days of fighting against the rival Palestinian faction Fatah. Since then, Hamas militants have launched thousands of rockets into Israeli towns. Israel carried out two punishing military offensives, one in the winter of 2008-2009 and another late last year which killed the chief of the Hamas military wing. Israel pulled out of Gaza in 2005, but imposes a maritime blockade and controls the flow of goods coming from Israel into the territory. Gaza's Hamas rulers and their backers still refer to Israel as "the occupation," referring to Israel's control of the West Bank and reflecting a belief that the presence of a Jewish state in the Middle East is an illegitimate occupation. The Fatah-dominated Palestinian Authority, which governs in the West Bank, condemned al-Qaradawi's visit, saying his presence is cementing the rift between the two Palestinian factions. Fatah and Hamas have tried to reconcile their differences in recent years but failed. Western leaders have demanded that a unified Fatah-Hamas government must recognize Israel and agree to enter peace negotiations. Hamas has refused. The emir of Gulf state of Qatar also visited last year, and Turkey's Prime Minister Recep Tayyip Erdogan said he'll visit by the end of the month, despite a U.S. plea that he delay the trip in order not to harm efforts to broker a reconciliation between Turkey and Israel. Al-Qaradawi arrived in Gaza late Wednesday to an enthusiastic welcome by Hamas Prime Minister Ismail Haniyeh and his Cabinet ministers. They hosted the cleric Thursday in a tent set up on the site of the prime minister's office, which Israeli warplanes demolished in 2009.